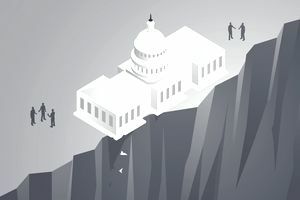 The fiscal cliff is a combination of five tax increases and two spending cuts that were scheduled to occur on January 1, 2013. If Congress hadn’t taken action in time, taxes would have increased and government spending would have been drastically reduced in one day. The Congressional Budget Office estimated it would have removed $607 billion from the economy in the first nine months of 2013. The economy would have contracted 1.3 percent, throwing the country back into the Great Recession. Federal Reserve Chairman Ben Bernanke first used the term on February 29, 2012. He warned the House Financial Services Committee, "Under current law, on Jan. 1, 2013, there’s going to be a massive fiscal cliff of large spending cuts and tax increases..."
The five tax increases were the December 31, 2012 expiration of three tax cuts and a tax credit. The renewal of those taxes would occur on January 1, 2013, the same day a new tax would begin. Capital gains taxes would have risen from 15 percent to 20 percent. Dividend taxes would have risen from 15 percent to more than 43 percent. Estate taxes would have gone from 35 percent to 55 percent, depending on the size of the estate. The second was the expiration of the 2 percent payroll tax holiday enacted by the 2010 Obama tax cuts. On January 1, 2013, workers would have an additional 2 percent Social Security taxes taken out of their paychecks. The third was the end of the alternative minimum tax patch. The AMT would have snared 21 million more workers making as little as $50,000 a year. The AMT was initially set up to capture wealthy tax dodgers. But since it wasn't indexed for inflation, it would have raised taxes for many middle-income taxpayers by as much as $3,700. The fourth was the expiration of tax credits expanded by the American Recovery and Reinvestment Act. These included expansions of the Earned Income Tax Credit, which provides aid to low-income workers. Extensions of the child credit and the American Opportunity tax credit, which helps families pay for college tuition, would also have expired. The fifth was the increase from new Obamacare taxes. That was a 3.8 percent hike on capital gains and dividends for high-income brackets. Republicans wanted to repeal Obamacare and its taxes, but they didn’t have the votes to do so. The two spending cuts were the expiration of the extended unemployment benefits and sequestration. The sequester would have cut 10 percent on average out of the federal budget. If the fiscal cliff had occurred, it would have thrown the economy into recession. Two-thirds of the $607 billion projected loss due to the following tax increases. Expiration of Bush and ARRA tax cuts - $229 billion. Expiration of payroll tax holiday - $95 billion. Expiration of partial expenditure of investment properties - $65 billion. Obamacare tax increases - $18 billion. Sequestration - $65 billion. Of that, $55 billion would have come out of military spending. Other departments would be cut 8 percent. Expiration of extended unemployment benefits - $26 billion. It would have hurt 2 million job seekers. Reduction in Medicare payments to doctors - $11 billion. Other unspecified changes reduced the deficit by another $105 billion. Although the economy would have recovered in the second half, the growth would be only 2.3 percent. Congress didn't take action on preventing the cliff until the last minute. The uncertainty began slowing economic growth in May 2012. Businesses and investors knew Congress wouldn't take action until after the 2012 presidential election. The two candidates held widely different philosophies on the best way to reduce the debt. Democratic incumbent President Obama favored allowing the tax cuts to expire on the wealthy. Republican contender Governor Mitt Romney preferred to keep the tax cuts but reduce non-defense spending. As the closely contested campaign raged on, business leaders waited. They didn't want to hire or expand their companies in the face of a potential recession. Most businesses included the fiscal cliff scenario in their operational plans. Uncertainty around the outcome kept economic growth too slow to reduce unemployment. Goldman Sachs CEO Lloyd Blankfein said that their businesses were sitting on more than $1 trillion in cash, waiting for Washington to sort it out. Some business owners sold their companies in 2012 to avoid possible capital gains tax increases in 2013. After the November election, the stock market fell. Stockholders began taking profits to avoid potential fiscal cliff tax increases on capital gains and dividends. A failure of fiscal policy caused the fiscal cliff. The seeds were sown in the 2010 midterm elections when Tea Party Republicans gained control of the House of Representatives. They had campaigned on the deficit and debt reduction. They insisted on spending cuts, not tax increases. President Obama and a Democrat-controlled Senate wanted to end the tax cuts for the rich. The difficulty in reaching a compromise showed just how far both sides had dug into their ideology. At the same time, federal spending was going to exceed the $16.394 trillion debt ceiling early in 2013. Obama tried to make raising the debt ceiling part of the fiscal cliff negotiations. If Congress didn't raise the ceiling, the nation would have defaulted on its debt. To end the stalemate, both parties agreed to appoint a bipartisan commission on February 1, 2010. Obama charged the commission to lower the budget deficit to 3 percent of the gross domestic product. On December 1, 2010, the Simpson-Bowles Report was submitted to Congress, which ignored it. Instead, Congress passed the Budget Control Act in August 2011. It mandated sequestration if a solution wasn’t reached by December 31, 2012. The Democrats refused to extend the Bush tax cuts for families making $250,000 or more. The Republicans declined to extend the tax cuts for anyone if everyone couldn't have them. The Democrats wanted to cut defense spending. Republicans wanted to cut Social Security, Medicaid, and Medicare. The Republicans wanted to repeal the Obamacare taxes. Obama said his highest priority after winning the election was to work with Congress to resolve the fiscal cliff. On November 22, the president met with the leaders of the House and Senate. It seemed a deal was imminent. Senate Majority Leader Harry Reid said the talks went so well that he thought it would be done before Christmas. It seemed the two sides were more than willing to compromise. The Democrats would cut a little more than they wanted. Republicans would allow more tax increases than they wanted. Obama developed a "Plan A" proposal. Obama included some stimulus spending, such as building roads, that he surely knew wouldn't get passed. He also hinted he would be willing to let extended unemployment benefits go. Obama left room for negotiation and compromise. In early December, the two parties were pretty close in some areas. For example, no one wanted sequestration. On December 12, JP Morgan Chase CEO Jamie Dimon said that the business community was OK with a higher tax rate if Congress would cut entitlement spending. This showed that businesses were more relaxed about tax increases than many Republicans. He went on to add that the economy would immediately leap to a 4 percent growth rate once the cliff was resolved. His prediction indicated just how much the uncertainty around the fiscal cliff was hurting the U.S. economy. In December 2012, House Speaker John Boehner proposed a "Plan B" compromise. He wanted to allow the Bush tax cuts to expire for incomes above $1 million. But he lost the support of the Tea Party. Many had signed a pledge that they could not vote for tax increases. They worried that if they allowed any tax increase, they would lose the mid-term elections in 2014. Instead, they were willing to let the Bush tax cuts expire. If the country slipped off the cliff for a few days, they could vote for a tax cut from the new rate. They didn't think it wouldn't be disastrous, as any agreement would be retroactive. Stock market futures dropped more than 200 points on the news. Congress adjourned for the holidays, promising to find a solution before the end of the year. The Bush tax cuts remained on incomes below a threshold. This threshold was $400,000 for individuals and $450,000 for married couples. Incomes at and above the threshold were taxed at the Clinton-era 39.6 percent tax rate. Capital gains and dividend taxes were raised from 15 percent to 20 percent for families at the threshold and above. Estate taxes were raised to 40 percent of estates above $5 million for those at and above the threshold. The 2 percent payroll tax credit expired. The income level at which the alternative minimum tax kicks in was permanently raised so it didn't affect middle-income taxpayers. It was indexed for inflation so that Congress no longer had to patch it year after year. The extended unemployment benefits continued through 2014. Sequestration was postponed for two months. The spending cuts that Republicans wanted were folded into the fiscal year 2014 budget negotiations. Congress extended some exemptions and deductions. These included the mortgage insurance premium through 2013 and the American opportunity tax credit through 2017. These also permanently covered the earned income tax credit. It limited these exemptions for individuals earning more than $250,000 and for married couples earning $300,000. The House approved the American Taxpayer Relief Act just in time to address the expiration of certain provisions in EGTRRA and JGTRRA and the activation of provisions for budget sequestration of the Budget Control Act of 2011. It prevented a 37 percent decline in Medicare payments to doctors. It extended federal dairy subsidies through the end of FY 2013. This prevented a hike in milk prices. It excluded Obama's proposed 0.5 percent pay raise for Congress. Like most other legislation, the bill contained some last-minute riders to provide a hodgepodge of smaller tax exemptions for special interest groups. These ranged from tax breaks for NASCAR, Hollywood, and AMTRAK. Plug-in electric scooters and a rum tax for Puerto Rico were also among the 10 weirdest parts of the fiscal cliff deal. The country actually fell off the fiscal cliff for barely 24 hours. Since all Bush tax cuts expired, tea party Republicans technically couldn't be accused of raising taxes. Instead, they reinstated the tax cuts for incomes at $400,000 or less. They then instituted a smaller tax cut for incomes above that amount. Congress wanted to vote on the measure before newly elected members took office that Thursday. This shifted the voting power more toward the Democrats, even though the House retained a Republican majority. The greatest irony about the fiscal cliff crisis was that it was all self-imposed. Perhaps Congress didn't understand economics. True, the U.S. debt-to-GDP ratio was more than 100 percent, an unsustainable level. But for an economy as strong as the United States, it wasn't an immediate threat. In fact, investors were more than happy to keep buying U.S. debt, keeping interest rates at 200-year lows. That wasn't the time to worry about the national debt. But in 2012, the United States was barely in the expansion phase of the business cycle. The CBO recommended that Congress should have extended all tax cuts and kept spending at current levels. In that case, the economy would have grown 4.4 percent in 2013. At that growth rate, job creation would rise and the unemployment rate would drop. That would eliminate the need for extended unemployment benefits as these are tied to above-average state unemployment rates.